← WHERE HAVE I BEEN?? Hooray for living in Wyoming. It’s already nasty and cold outside, and the snow is trying desperately to cling to my yard. Hats are being made as well as gloves, as I’m evidently already behind now. My obsession with making my crochet look knit continues, and I tried making a hat for DD with post stitches, but I used half double crochets instead of double crochets. It worked out pretty nicely! It’s actually pretty stretchy, and visually much nicer than double or treble post stitches. I didn’t write up a pattern, but I can give you a nice recipe for what I did! 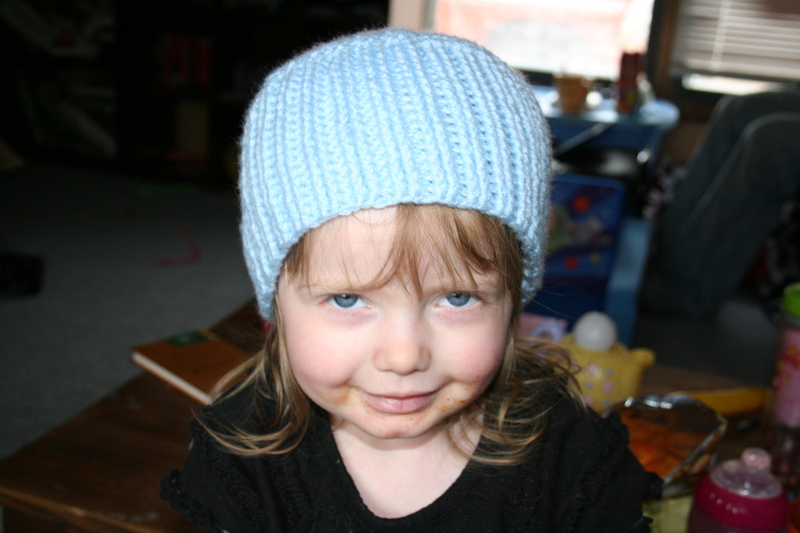 I suppose I call it First Snow Beanie. I used an F hook, and some mystery unlabeled yarn. It’s baby/sport weight, and I’m guessing bernat. It’s acrylic, I can tell that much. I used a bit tighter tension than I usually do, as well. I made it for my 2 yr old daughter, and it’s nice and snug. And covers her ears well. I started out with 10 dc’s into a magic loop, then joined. I ch’d 1 at the start of each round, and worked my first st into the same st as join. It makes for a cleaner start. I worked in hdc from there, and increased by 10 each round. So, first round 2hdc in each st, then every other st on next round, and so on. I worked until I had 90 sts total. You’ll need to get to a multiple of 6, whatever size you’ll be making. After you get to the size you want, you’ll switch to post ribbing, but hdc post st ribbing. I started with 2 bphdc, then 1 fphdc. So, a 2×1 rib pattern. I just worked in that until I got the length I wanted! It’s so cute! And she lets me keep putting it on her. Which is a good sign…means I shouldn’t have to add ties to make it stay on, but knock on wood there. I’d like to make an adult one for her daddy, since he’s out in the cold during the day 😦 poor daddy! I already made him one hat but it never hurts to have more. I’m working on some mittens for her to match. I’ve got one made so far, but I wrote down exactly what I did on these. The ribbing got a little slack, but I keep getting distracted whilst making it..not to mention more toddler ‘crochet’ work was put into it. hehe. 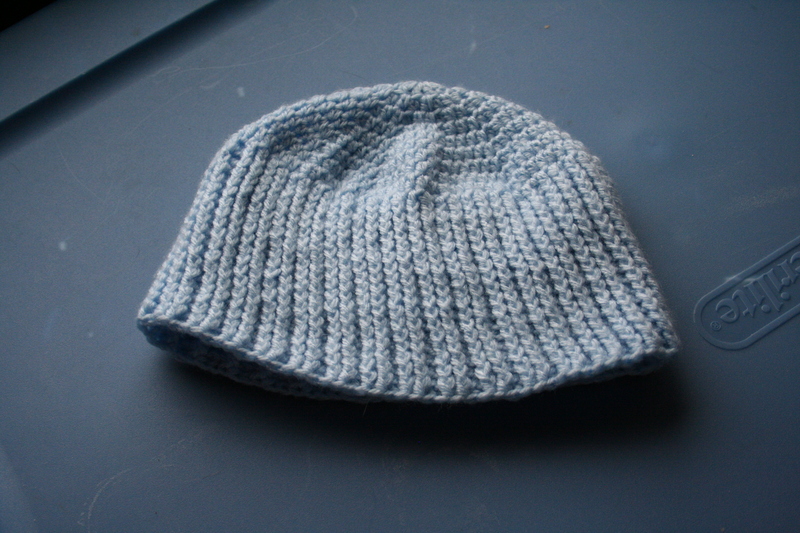 But that does seem to effect the ribbing, which doesn’t look as nice as the hat. I’ll have to see how the second mitten turns out. 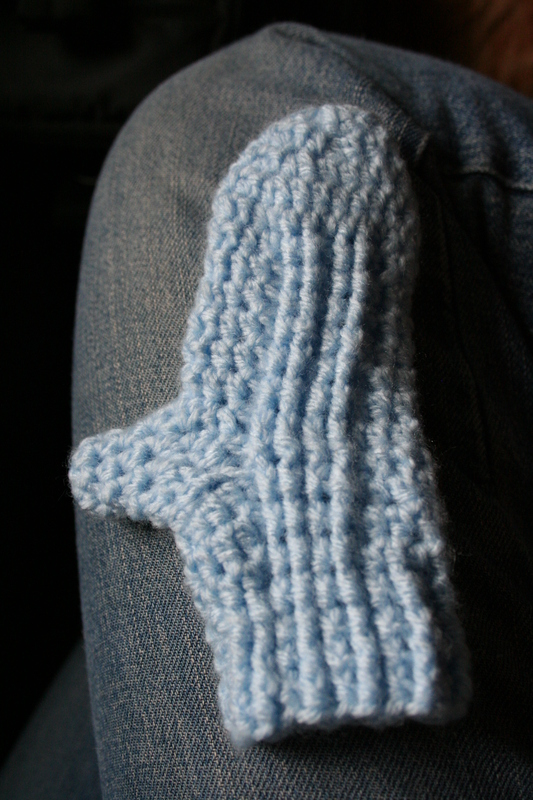 I’ll post the mitten pattern after I get the second one done and make sure there are no errors in it. The hat off her head. It actually cinches up quite more than I’d thought it would. Yay! 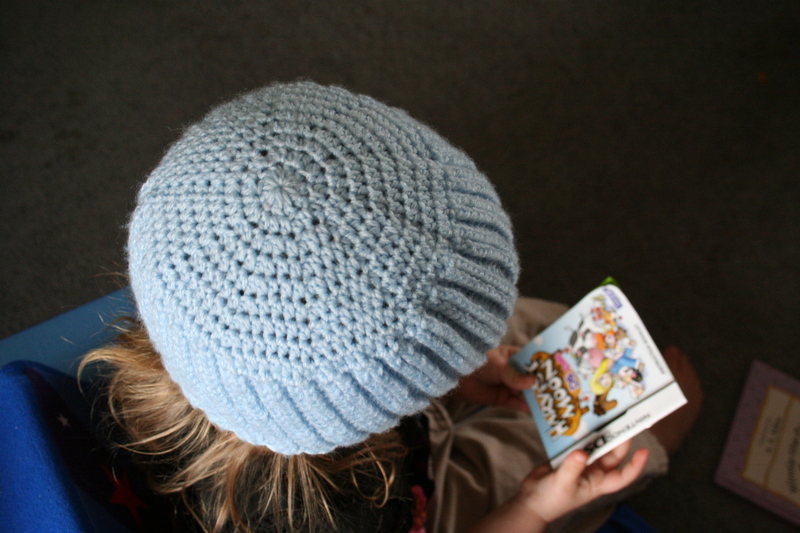 I may make one for myself, if I can convince myself to wear tight hats. haha.